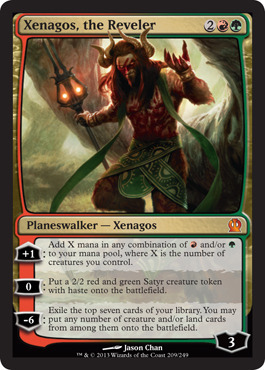 Theros is shaping up to be a very interesting and flavourful set, and beyond that, a very nice set for EDH. We’re getting a lot of new tools for all sorts of decks, including mechanics and commanders. Here is my EDH focused review of Theros. First of all, let’s take a look at the mechanics of Theros, those being Bestow, Monstrosity, Heroic, Devotion and Scry. 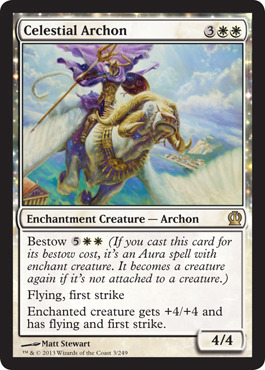 Bestow: A static ability (actually it represents two static abilities) which lets you cast creatures with Bestow as auras which grant their abilities and stats to the enchanted creature. The bestow cost is more than the cost cast the creature, however the bestowed card turns back into a creature when it unattaches from the enchanted creature. This proves very useful in Enchantress decks, as it gives you easy-to-fetch-and-protect creatures with some resiliency if you wish to cast them for more mana. Monstrosity: An activated ability which lets you spend mana to activate it at any time while the creature is on the battlefield. It can only be activated once but grants the creature N +1/+1 counters and makes them monstrous. 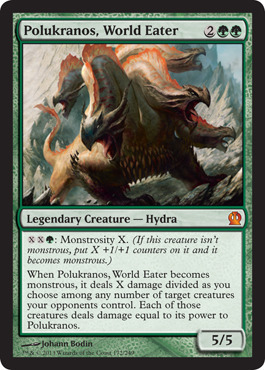 Most creatures with Monstrosity have some sort of triggered or static ability tied to it when it becomes/is monstrous. Heroic: A triggered ability which triggers upon becoming the target of a spell you cast. This is an ability word, so all kinds of things can happen, from giving all your creatures +1/+1 and trample, to drawing cards. This is a more focused mechanic because you need to build around it to make it truly effective. Devotion: A reworked version of Chroma to make it more focused and flavourful. Your devotion to [colour] tracks the coloured mana symbols on permanents you control, and all sorts of things can be done with it. Scry: The returning mechanic of the set. It’s fantastic library manipulation and is being stapled to all sorts of cards now. There are few worth running. Enchantments: Many people thought Theros would have a lot of “enchantments matter” cards, much like Mirrodin did for artifacts. Well that’s not really the case. In order to keep enchantments relevant, R&D decided they wanted all enchantment creatures to have an enchantment aspect. The Gods just become legendary enchantments if your devotion is low, and other enchantment creatures have bestow. There are also other enchantment permanents, those being the Gods’ weapons. The weapons have a static or triggered ability, and an activated ability that compliment the Gods’ own abilities respectively. The Gods: The five main Gods of Theros are tied to the five colours of Magic. We have Heliod, Thassa, Erebos, Purphoros and Nylea (Gods of the Sun, Sea, Death, Forge and Hunt respectively). Each God is an indestructible legendary enchantment creature that isn’t a creature as long as your devotion to [colour] is less than five. They all cost 4 mana (except Thassa who costs 3) and they each only have one coloured mana symbol (to avoid making it too easy to hit their devotion requirement). Now that we’ve gone over the basics, let’s look at the individual cards I think will be able to make a splash. There are a decent amount of them, to be sure. 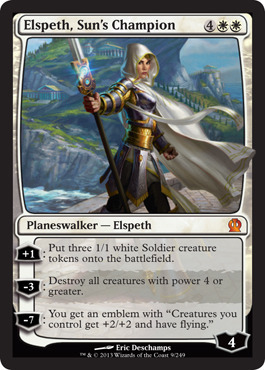 White is arguably the weakest Commander colour this time around. With all sorts of one-shot spells outclassed by older ones, there isn’t much in the way of useful things for EDH. But for what we do have, it’s pretty good; Celestial Archon, Elspeth, Sun’s Champion, Evangel of Heliod, Gift of Immortality, Heliod, God of the Sun, Phalanx Leader and Spear of Heliod. Though there are few playable cards, these all fit in to some specific decks, in fact most of them fit into token decks, which is always nice. In terms of playable blue cards, we have much more variety here. cards like Artisan of Forms, Bident of Thassa, Curse of the Swine, Master of Waves, Meletis Charlatan, Prescient Chimera, Prognostic Sphinx, Shipbreaker Kraken and Thassa, God of the Sea fit into many more decks, and are much more good-stuff-y than the white cards of Theros, which a couple deck-specific cards (Master of Waves and Shipbreaker Kraken). Black is much like blue here, a lot of nice good-stuff cards, sprinkled with a couple deck-specific stuff. Abhorent Overlord, Erebos, God of the Dead, Gray Merchant of Asphodel, Hero’s Downfall, Hythonia the Cruel, Nighthowler, Read the Bones, Rescue from the Underworld and Whip of Erebos are all pretty much fantastic, with the all-stars being Erebos and his Whip. Perhaps most disappointing of all is red. 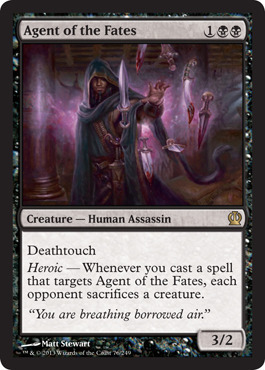 We got barely anything that matters for Commander here beyond incredibly deck-specific stuff I didn’t mention. 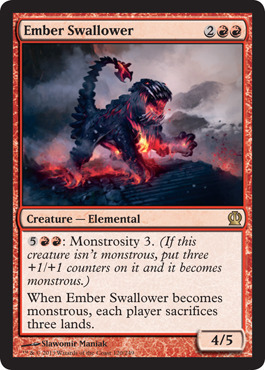 Anger of the Gods, Ember Swallower, Fanatic of Mogis, Hammer of Purphoros, Purphoros, God of the Forge and Stormbreath Dragon are the only cards I can think of that will actually see a good amount of play. Green is just full of goodies this time around for all kinds of decks. 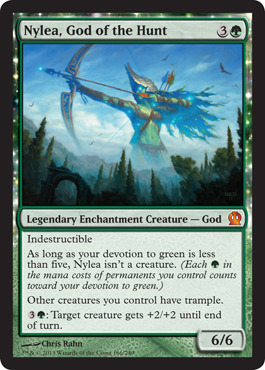 Anthousa, Setessan Hero, Arbor Colossus, Bow of Nylea, Commune with the Gods, Karametra’s Acolyte, Mistcutter Hydra, Nemesis of Mortals, Nylea, God of the Hunt, Ordeal of Nylea, Polukranos, World Eater, Reverent Hunter, Satyr Piper and Sylvan Caryatid will all see play somewhere, giving green the biggest EDH presence in Theros, and I’m sure not complaining. 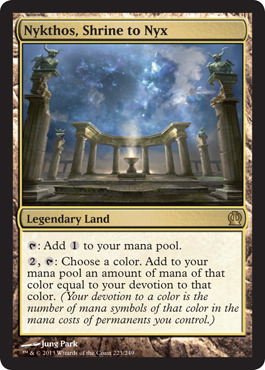 With all the mono-coloured matters stuff running around in Theros, you might not expect there to be a strong multicolour presence in Theros, but there certainly is for Commander. Akroan Hoplite, Anax and Cymede, Ashen Rider, Ashiok, Nightmare Weaver, Daxos of Meletis, Fleecemane Lion, Horizon Chimera, Medomai the Ageless, Polis Crusher, Prophet of Kruphix, Psychic Intrusion, Reaper of the Wilds, Shipwreck Singer, Spellheart Chimera, Steam Augury, Triad of Fates, Tymaret, the Murder King, Underworld Cerberus and Xenagos, the Reveler are all fantastic cards, and some were clearly made with EDH in mind, which I really love. There are even a few playable artifacts in Theros. Akroan Horse, Burnished Hart, Colossus of Akros, Opaline Unicorn and Prowler’s Helm aren’t really much, but they have their places and are rather fun/decent in the right decks. Finally, we have the lands. 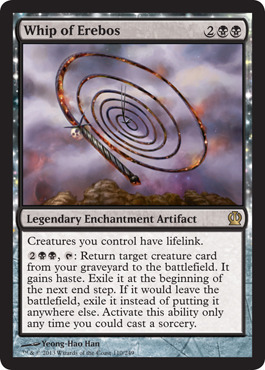 The Scry lands are interesting enough, at least enough to replace a basic or two, or replace your Guildgates. But more interesting is Nykthos, Shine to Nyx. It’s a staple in every mono-coloured deck, and will even see play in multicolour decks, just as a filter. There are just two things I want to address at the end here, and these are 100% opinion based, so if you don’t agree with my views and play styles, then just skip this part. I wanna talk about my favourite new commanders, and my favourite cards from the set in general. We got quite a few new generals this time around, though that was to be expected from the start. 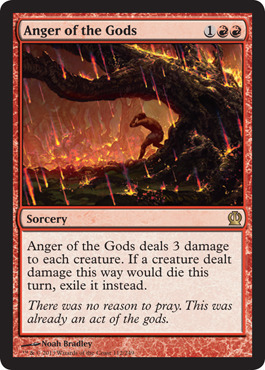 Purphoros, God of the Forge – Mono Red Token-Burn. I personally think it would be a blast just burning away everybody with pandemonium effects every turn, and I love tokens. Anax and Cymede – White/Red Token-Burn. The same archetype as Purphoros, done completely differently. Use a lot of re-usable and mass-target spells to pump your army and keep the burn from killing your stuff before you go in for the attack. Triad of Fates – White/Black Blink-Control. Fill your deck with great blink targets like Ashen Rider and Angel of Despair, and don’t forget to abuse Oblivion Stone to seal the fate of multiple creatures in one turn, or protect your own things faster. Erebos, God of the Dead – Mono Black Control. As a draw engine that prevents your opponents from gaining life, Erebos is invaluable to the deck, a great commander for a beloved archetype. Hythonia the Cruel – Mono Black Voltron. Hythonia is fantastic in that she doesn’t really need much evasion equipment to be a threat. You can wipe the board, attack and then blink her with Conjurer’s Closet to keep the path clear. 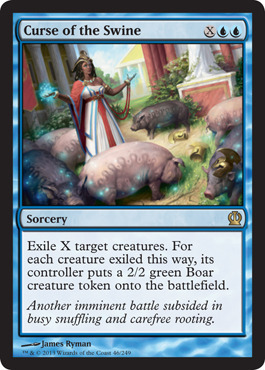 Prophet of Kruphix – Being the best parts of a Seedborn Muse and giving your creatures flash is a beautiful thing, something that my Animar deck has needed for quite some time. Gift of Immortality – This card is great, my favourite thing about it is making Sun Titan really hard to get rid of. Spear of Heliod – I love anthems. I love them even more when hey can shoot creatures down. Bow of Nylea – It makes tokens decks 100% more deadly, it’s just so good. Karametra’s Acolyte – Wow. This is the mana dork I’ve been looking for a long time. Being able to make more green equal to the green you already have? Wonderful. Mistcutter Hyrda – Can you tell I like Green yet? Mistcutter Hydra is an autoinclude in decks that care about +1/+1 counters. Purphoros, God of the Forge – I love red enchantments, especially when they do crazy stuff like Pandemonium-esque effects. Keep on rocking, Purphoros. Abhorrent Overlord – I like tokens and I like harpies. It’s also a demon that lets you sac creatures. There’s a lot of usefulness there. Erebos, God of the Dead – Another Everlasting Torment-esque card to throw in burn decks and MBC, might try running it in something eventually. Whip of Erebos – More wondering things for token and graveyard decks! 4 mana unearth for anything AND lifelink? I’m not usually this drawn to Black. 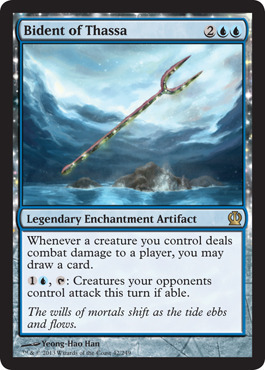 Thassa, God of the Sea – Amazing scry engine, and able to make your saboteurs unblockable, simply goodstuff. Master of Waves – Hilariously good in an Elemental Tribal deck, finally a lord that isn’t red, right? 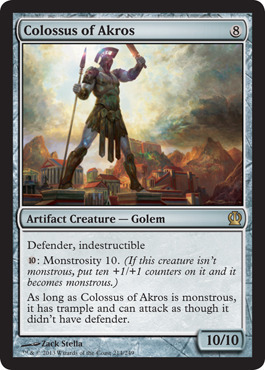 Akroan Colossus – Easily my favourite Golem. It’s just so splashy and hilarious, I can’t wait to try it out myself. Nykthos, Shrine to Nyx – Oh look, it’s a budget replacement for Gaea’s Cradle ! Fantastic! All-in-all, I’d say Theros is great for Commander. It didn’t give us so much as to detract from other formats, but just enough to freshen up our decks and give ideas to brew new ones. Thanks to Wizards R&D for another fantastic set, one that I give an 8/10 on my abstract and undeveloped scale. Now, I’d like to know what you think of Theros for Commander, what are your favourite cards, and how will they impact your game? Let me know by reply, ask or reblog. And if you feel I missed anything, or disagreed with anything I said, then don’t be afraid to discuss it with me.